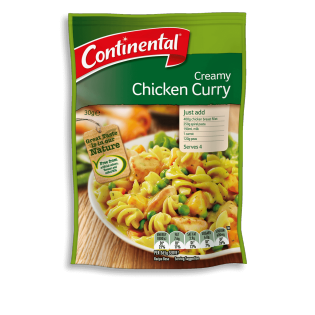 Your family will love Continental's delicious creamy chicken curry pasta made with a rich yet mild curry sauce. Learn how to create this flavourful meal here. Corn starch, milk powders (cream, skim milk), salt, natural flavours, maltodextrin (from wheat), spices, yeast extract, mineral salts (451, 452), sugar, onion powder, sunflower oil, parsley. Just Add... 400g chicken breast fillet 250g spiral pasta 190mL milk 1 carrot 120g peas Prep 10mins Cooking 15mins Simply... 1. Cook 3½ cups (250g) spiral pasta following packet directions; drain. 2. Heat 2 teaspoons oil in a medium saucepan or frying pan and brown 400g cubed chicken breast fillet. 3. Add combined Recipe Base, ½ cup (125mL) water and ¾ cup (190mL) milk with 1 diced carrot and 1 cup peas; stir to combine. 4. Simmer for 5 minutes or until chicken and vegetables are cooked. Stir through cooked pasta. Serve with a tossed green salad. Here's an idea... For a creamy coconut style curry, use coconut milk in place of milk.